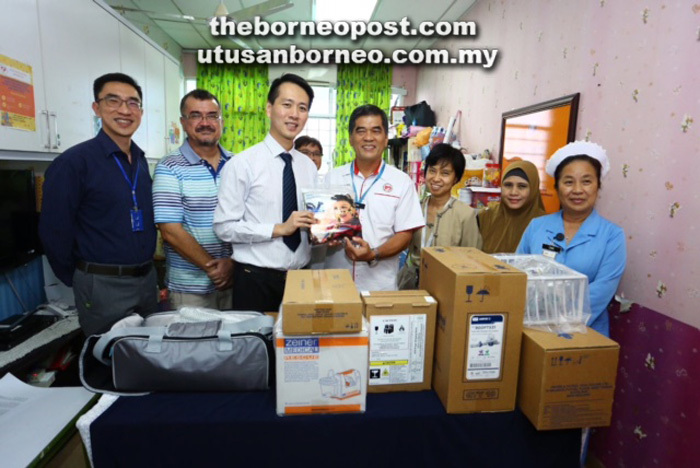 Dr Ong (third left) handing over some of the donated medical equipments to Dr Chin, while SCCS committee members, medical personnel and Yahaya (second left) look on. KUCHING: Sarawak Children’s Cancer Society (SCCS) donated RM80,000 worth of medical equipment, television sets and Astro services to Paediatric Oncology Ward 2A of the Sarawak General Hospital (SGH) yesterday. SCCS vice president Dr Ong Eng-Joe said the donations are to help enhance the services provided by the paediatric oncology ward. The donated medical equipment comprised ventilator, suction pump, integrated flow generator, Oxygen Concentrators rechargeable battery, valued at RM72,500. The donations were proceeds raised via KRN30,000 Run against Cancer organised by Kuching Runner’s Network (KRN) and The Santa Run organised by Press Metal Bintulu Sdn Bhd. In addition, the society also donated five television sets inclusive of Astro services worth RM8,000 as a form of entertainment for the children who are receiving treatment at the children’s ward isolation rooms. “Through the donation of the medical equipment, SCCS hopes doctors and nurses will be able to provide better care and comfort for the children during their treatment. “At the same time, the society also hopes to bring cheer and joy to the children while they go through those challenging times,” said Dr Ong. Meanwhile, SGH director Dr Chin Zin Hing said the donation was very timely and useful to complement the existing facilities in the hospital. He said SGH operates on approximately RM500 million a year, which is spent on salaries, drugs and facilities. “We do request for a lot of equipment for the hospital but not all of our request will be approved because of budget constraint. “All of these efforts make the patients’, especially the children’s, stay much more comfortable. “Thank you SCCS for their kindness. We hope other donors who have this intention will come forward to us anytime,” he said, adding many parents and children spend a lot of their time at the Paediatric Oncology Ward. SCCS works closely with the medical team at the Paediatric Oncology 2A Ward and provides support in terms of sponsoring various lab tests and donation of various medical consumables. The society also sends relevant medical personnel for training with the hope of improving the level of care and understanding of the latest advancement in Paediatric Oncology. In 2017, the society spent approximately RM97,000 on medical support and training. Apart from medical treatment, the society understands the need to provide emotional support for caregivers during difficult times for the children and their families. The society has two support staff based at the ward to provide informal counselling sessions, to organise group sharing sessions and other activities for caregivers in the ward. Apart from corporate donations, SCCS depends on the public’s continuous support and funds collected via SCCS’s major ‘Go Bald’ fundraising event. SCCS is currently in the early stages of planning an upgrade of the children’s playroom and the parents’ waiting room; installing new cabinets for the daycare in the Paediatric Oncology Ward 2A, which are scheduled for completion mid-2019. Among the events that SCCS is organising in conjunction with the Childhood Cancer Awareness Month this month is the Colour Rush Run on September 17, 2018 at Saradise. Among those present at the handing over of the donations were SCCS manager for Programme and Services, Jodie Sim; a representative from KRN, Yayaha Iskandar; medical personnel of SGH and committee members of SCS.